This tab appears on the Inbox Properties dialog and is used to control how Mailtraq handles mail which is addressed to this site, but where the addressed mailslot cannot be found. The handling of mail which cannot be delivered is often called bouncing. This option refuses to accept incoming messages with recipient addresses which are undefined locally. This is the recommended setting for most systems. This is the most efficient option for dealing with undelivered mail because it places the responsibility for any action on the sending mail system and because Mailtraq does not have to download the message prior to its refusal. otherwise you are explicitly saying that you will accept all mail for any address. This option poses a slight nuisance risk by refusing legitimate mail because the sender failed to spell the name of a mailbox or alias correctly, but it ensures maximum protection for your mail installation. This option accepts the message then posts a separate message back to the sender notifying them that the message could not be delivered. While effectively performing the same duty as the Return to Sender option, the administrator may control the content of the bounce message by modifying the bounce.tpl template. By accepting unwanted messages from the sending system, this option makes Mailtraq responsible for their handling. This option should be used with caution because the production of bounce messages carries security implications and return addresses in the SMTP envelopes of junk messages are rarely valid. This option accepts all messages which are not barred and Mailtraq delivers them to the address specified in the associated textbox. That address may be a local mailbox, default is Admin (Updated from Postmaster from build 2128), or a full Internet address. This option allows for the possibility that some correspondents may make mistakes when addressing their mail but risks poorly addressed junk mail being delivered to the default account. Why is this set at start-up? - Return Undelivered Mail to Sender which is the best setting for nearly all situations. This option first accepts the incoming message then rewrites the forward path to the domain name specified in the associated edit box. The messages are them placed in the outbox for delivery to the revised domain. For example, mail addressed to user@original.host is rewritten to user@revised.host. This option causes Mailtraq to accept messages to unknown recipients and create suitably named mailboxes in which to store the messages. The new mailboxes are created by copying the settings from the existing mailbox specified in the Template drop box. The default template is <default> which creates appropriately named mailboxes which remain otherwise unconfigured. This option places undeliverable messages in the outbox unaltered and they are then delivered according to the rules in the Outbox Properties dialog. 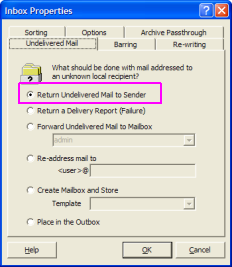 Note that this may result in a mail loop if the remote mail server to which the message are sent determines that it should route those messages back to the Mailtraq Server. If you are using an external email generator - such as a mass mailing program - avoid delivering very large quantities of messages to Mailtraq in a very short period of time to avoid having more than 40,000 messages pending, as Windows NTFS has folder access problems above that number of messages. Create batches of messages suited to your hardware. 05/12/2008 14:04:54 Router: (Depth 0) [message id] : "() Delivery Report (Failure)" from for ""
indicates that you have deleted the Postmaster mailbox. It is essential to have a Postmaster mailbox. You must create a new mailbox called 'Postmaster'.